Our school had four young Titoki trees which were meant to have been planted on Saturday, 8th of November, during the Jubilee celebrations but no one could find the spades or shovels so these lovely young trees sat in the Staffroom for a few weeks. 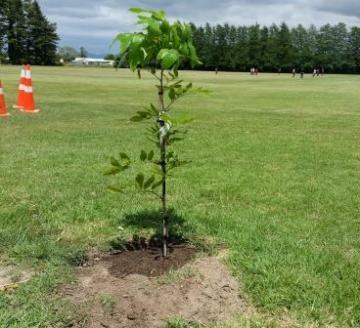 These trees were finally planted on the last day of school, Wednesday the 10th of December 2014. The children who came to school on this day got to watch this special occasion. All four trees would be planted where old trees used to grow but the old trees had to be cut down because they were sick or dying. 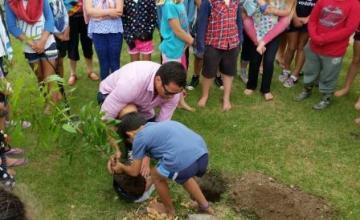 Matua Brett started with a Karakia while three Year 7 - 8 students and one Year 4 student got to hold onto and carry the trees. They were Brandon, Rebekah and Destiny from the Lockwood and Shane from Room 9. 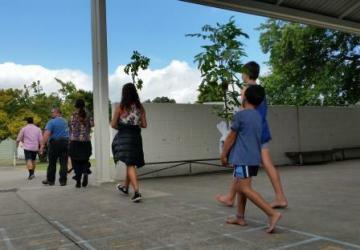 In the background are Mr Burke (behind Matua Brett), Whaea Carol, Ms Beattie and Mrs Mitchell. After the Karakia, we all followed Matua Brett to the first two tree sites. 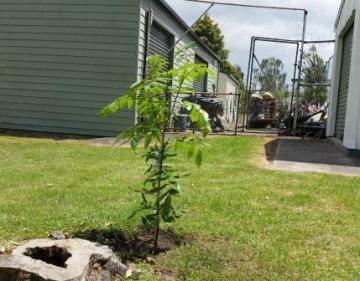 Here is Matua Brett and Shane putting the young Titoki tree into its new home. 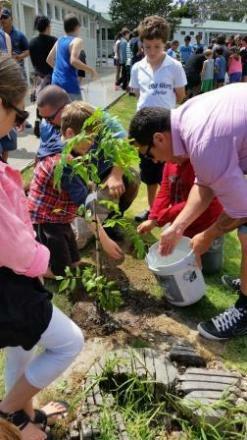 Here is Mr Brebner and Brandon (or part of him) planting the second Titoki tree. 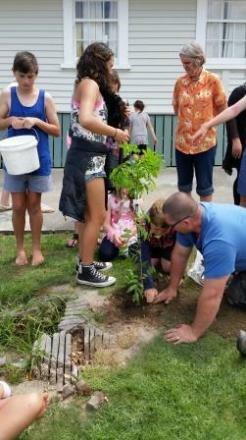 Here is Mr Burke and Destiny planting our third Titoki tree. Brandon has the bucket of water, Joshua is helping to scoop dirt around the young tree and Mrs Clark is watching patiently. 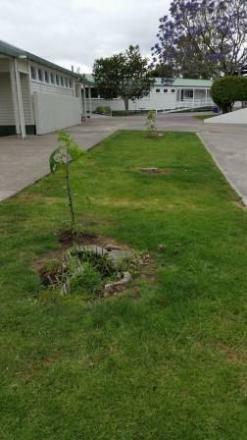 Matua Brett is finishing off pouring water over the dirt to give the tree a well-deserved 'drink of water'. Thomas (Whaea Sarah's son) is watching. In the background, you can see the last tree getting ready to be planted by Mrs Johnston and Rebekah. 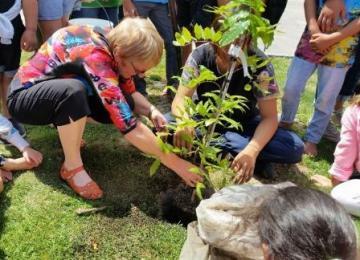 Here is Mrs Johnston and Rebekah planting our last young tree. Everyone was so excited to see the very last tree go down into the dirt. This is also Mrs Johnston's very last day! Mrs Johnston is retiring this year but will come back for visits next year. Happy retirement Mrs Johnston! 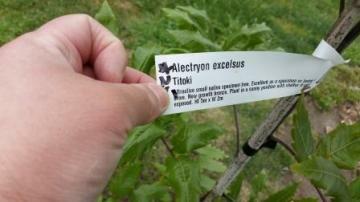 Here are our lovely new Titoki trees at home at last! 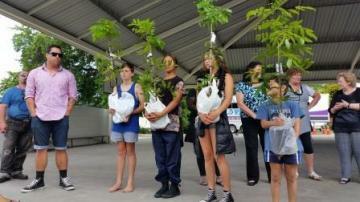 Our children said they would carefully watch over our new trees during the holidays. 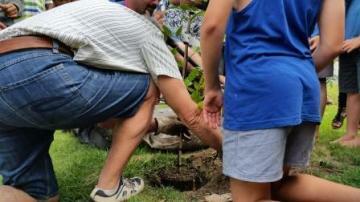 Mr Burke will come to school as well as some of the teachers, to help water our trees through the hot Summer days. Outside Room 4, next to the Edgecumbe College sheds and our PE shed. Outside Room 4, looking out over the College field. You can see some of our College students having a game of cricket. They do not finish for a few more days yet. Here are our other trees between the Multipurpose room and Rooms 5 - 6. Our classroom is just over that white wall on the right. Welcome to your new home Titoki trees!